Every time I mention that I went to Greece, someone asks me to write a post about it. I don't know if it's Greece specifically that people want to hear about or if they're just surprised by the fact that I've actually been to Europe. Either way, I decided to dig out my Greece pictures and take you on a flashback post. Hope you enjoy! During January term of my senior year in college (2008 for those doing the math), I took a class in Greek mythology. I got 3 credits for the class, traveled around Greece for 11 days, and all I had to do was pay something like $1,200 (I can't remember the exact amount) and read a book on Greek mythology. I think I won that round. Greece is the only place I've ever been in Europe, and I honestly think that if I never again get myself across the pond, I'll still be satisfied. So here's a snapshot of my time there. There's obviously way too much to detail out extensively (seriously, I have like 1,000+ pictures from the trip), but I'll hit the highlights. Due to some cancelled flights, we actually got to spend THREE extra days in Athens. All of those days were spent basically just wandering around on our own. 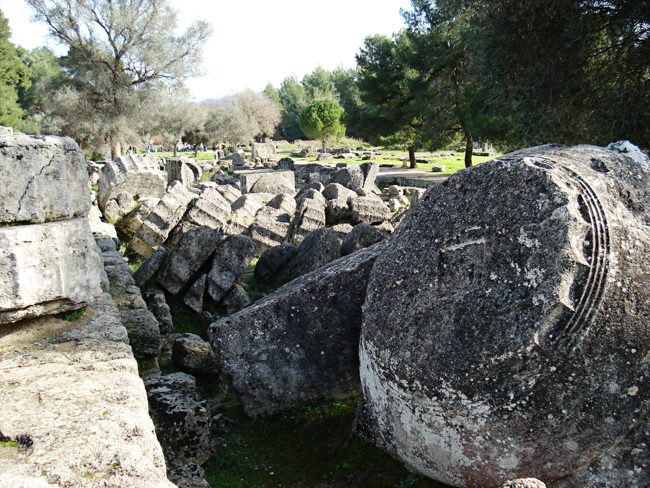 Our class was part of a tour, and for the rest of the week we took a guided bus tour all over Greece to see the ruins. 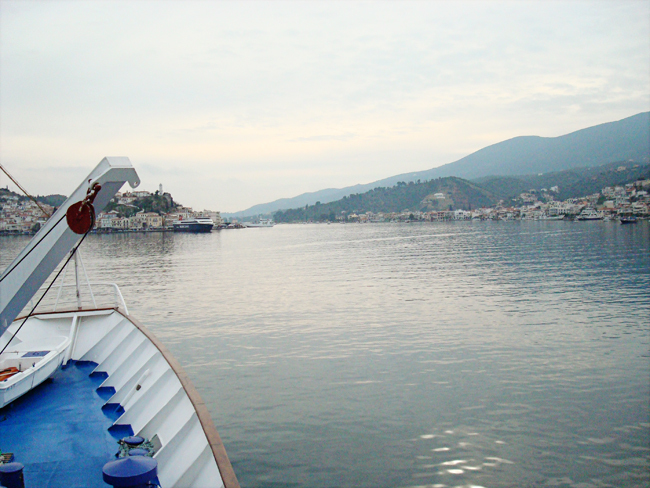 We also took a one-day cruise on the Mediterranean, which is pictured later on. NOTE: The following pictures are not in any kind of order of the trip. I did, however, resurrect my trusty Shutterfly book that I made of our trip many moons ago so I could have an accurate description of the pictures for you. 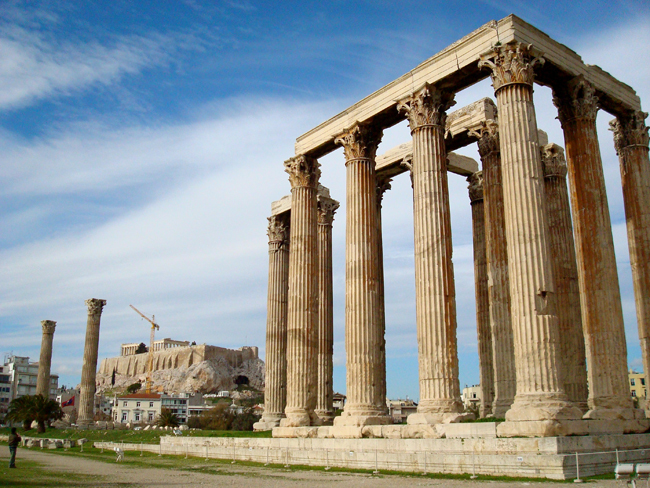 On our first actual day of touring sites in Athens, we visited the Temple of Olympian Zeus. The picture above this one is another view of the temple. It was really neat because we could see the Parthenon too! 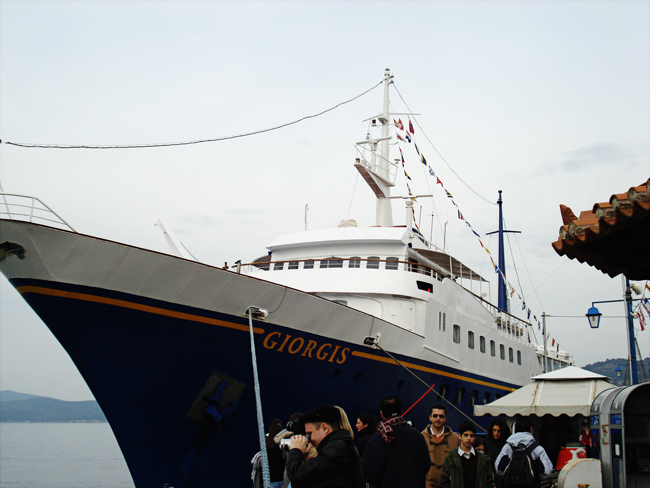 We took a one-day cruise from Athens to three Greek islands on the Mediterranean Sea: Poros, Hydra, and Aegina. 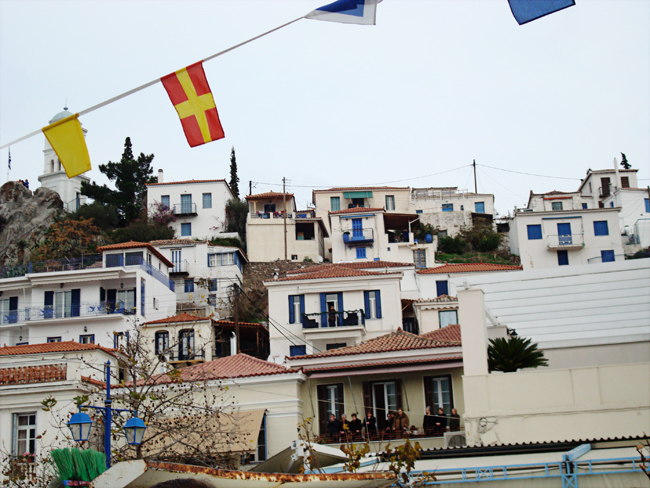 On Poros we got to see a special ceremony called the "Blessing of the Waters." It happens once a year during Epiphany, and it was really special that we were there for it! ^^^We took a three-day bus trip around Greece. We stayed at various hotels along the way and saw some cool sites and ruins all around Greece. It was awesome! 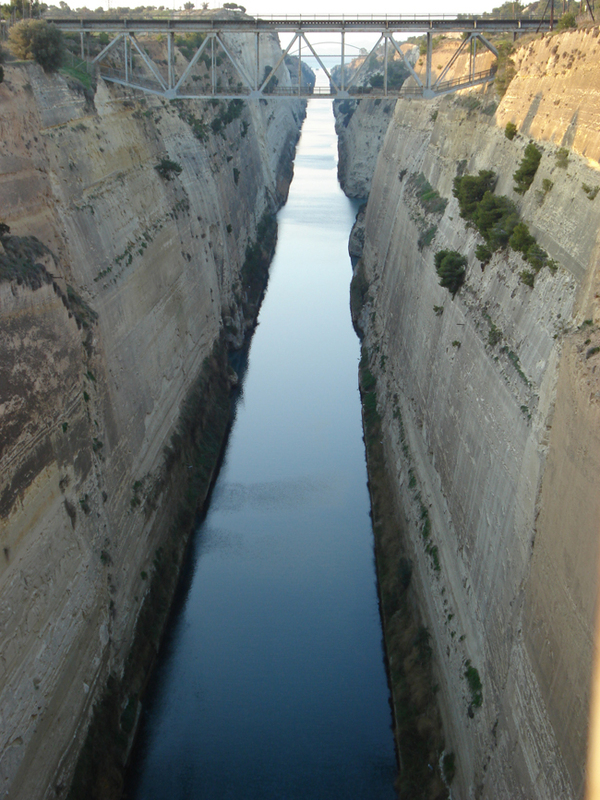 One of the things we saw on the trip was the Corinth Canal. We passed over it on the bridge but stopped to take pictures. It was built to connect the Ionian Sea and the Aegean Sea. ^^^I honestly don't remember if these were pictures on an island during the one-day cruise or if these are pictures from when we went walking around Athens. 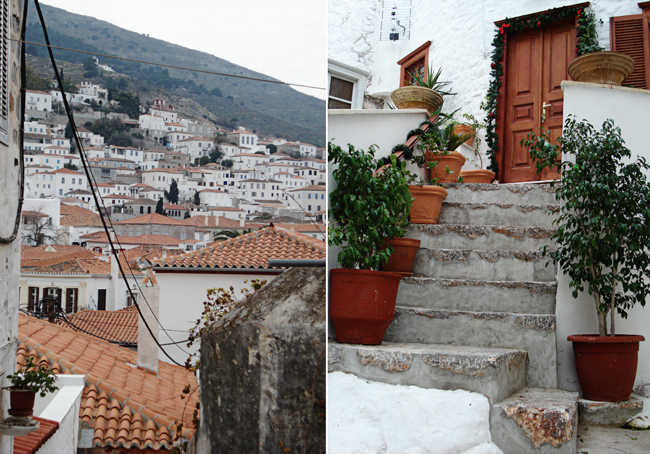 But I love how Greece actually does look in real life like it does in the movies! ^^^This picture was taken on the last day of our bus trip. (Can you see me? I'm the one blending into the background wearing all brown. WHY???) We made a few different stops on our way back to Athens. 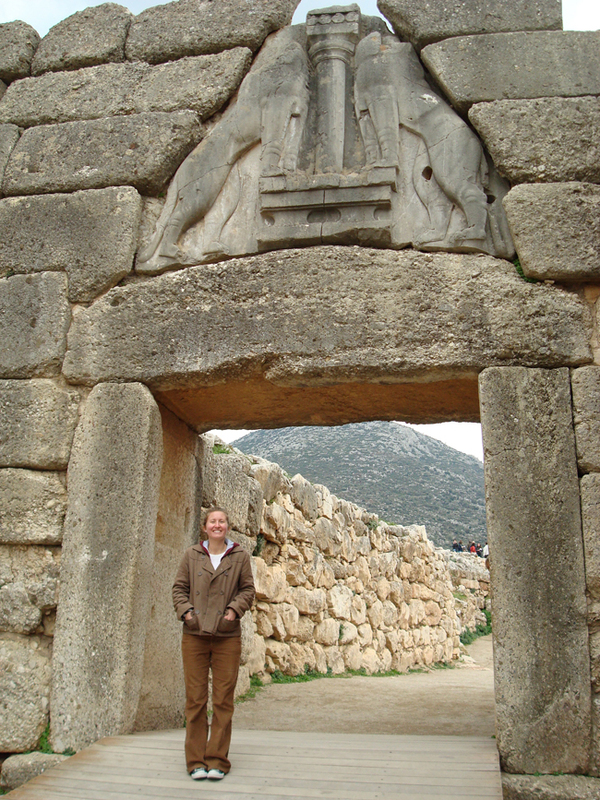 This is the "Lion's Gate," which is also where the Tomb of Agamemmnon was discovered in the 1800s. I remember our tour guide saying that it is very rare to get a picture with the gate where there aren't a bunch of tourists. We went during the off season, and it was nice because at all the places we went, there weren't too many people! ^^^The Central Market was one of my favorite places. I remember there being SO much food and so many different kinds. I mean look at all those olives! One thing I remember distinctly about this part was that as we walked around, people were totally staring at us. They were trying to talk to us in English and asking where we were from. One vender even had us take a picture next to his meat stand with, I kid you not, a literal dead pig's head. ^^^On day 2 of the bus trip, we visited Olympia, which is the site of the ancient Greek stadium where the very first Olympics were held. 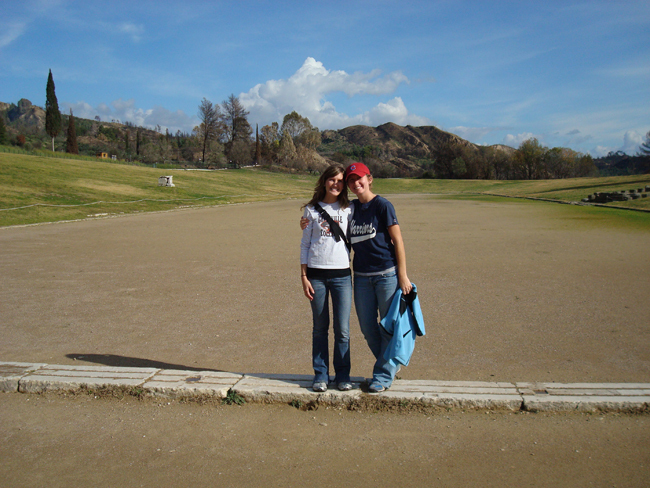 The picture above is my friend Lauren and I standing on the track & field arena, where they would do all the running events. Isn't that crazy? 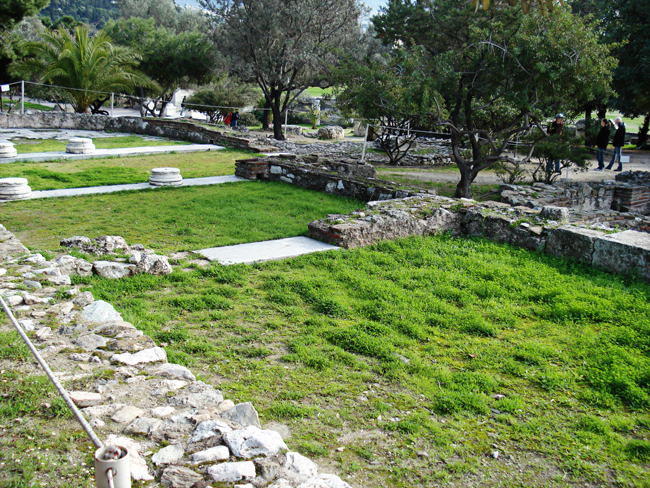 People would sit on the grass on the sides, and the men (only men were allowed to participate) would start on those stones, sprint to the end, and then come back. ^^^This picture is also from Olympia. 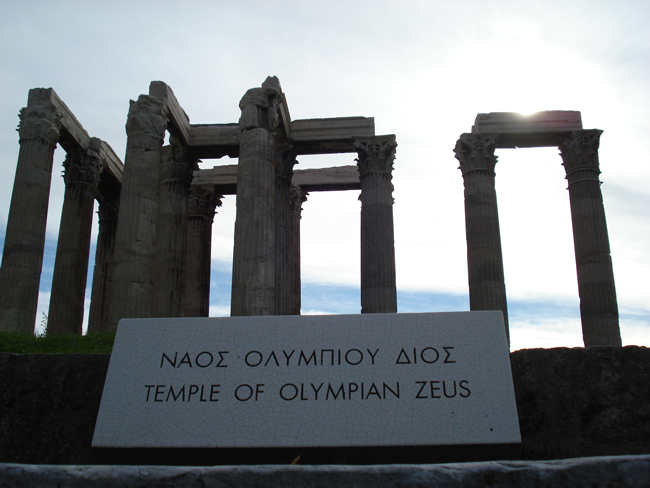 This was the Greek Temple of Zeus (not to be confused with the earlier picture of the Temple of Olympian Zeus). It was destroyed in an earthquake, and the 6x13 columns all fell, leaving exactly what you see in the picture--a domino-type effect. ^^^These are the Roman Baths (I'm pretty sure that's what this is, but don't quote me on that). I didn't have this picture in my Shutterfly book, but that's what the caption is on my flash drive. ^^^This is the Theater of Epidaurus. It was built in 400 BC and was used until 400 AD. It is actually still 99% intact today because rain and erosion caused the whole thing to be covered in dirt until it was discovered many years later, so it was very well preserved. The acoustics in this place are insane. The theater seat 15,000 people, and anyone sitting anywhere in the entire theater can hear even the smallest sound from someone standing in the middle. Even today, no one knows how they were able to create such an acoustically perfect theater. ^^^Lauren and I on top of Fhilopappos Hill. 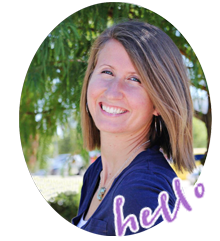 You may recognize Lauren from other posts on this blog. She's still one of my best friends and was a bridesmaid in my wedding! We were friends before going on the trip, and it was fun to share the experience with her. 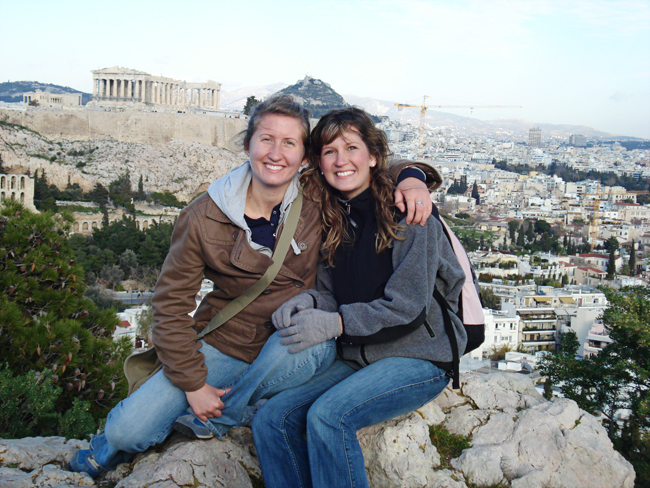 From Fhilopappos, you get an amazing view of Athens and the Parthenon. We actually walked up this hill (it was a tiny mountain kind of) a few times during the 11 days we were there. On our last night, we watched them light up the Parthenon, which was really cool. Then I got home and slept for days and days. I found this gem on the flash drive and decided to share. 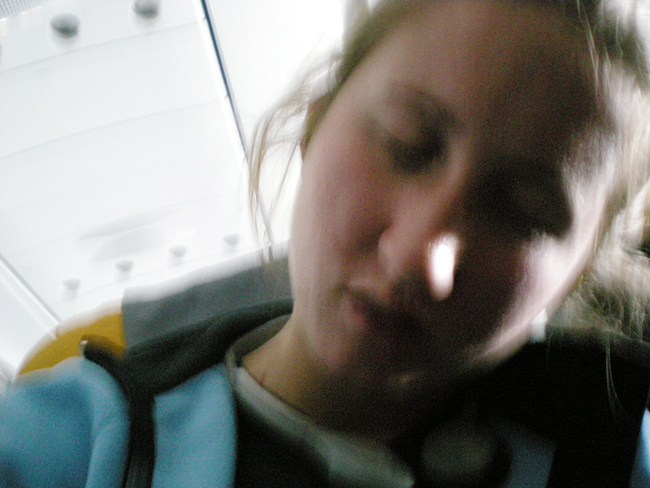 One thing I won't forget about that trip was the 8-hour layover in DC after an 11-hour flight from Germany. We were those people passed out on the airport floor. I don't ever remember being so tired. It was the trip of a lifetime for sure, and I'm so thankful I was able to go! Given the chance, I would most definitely go back! What location is top on your travel bucket list right now? 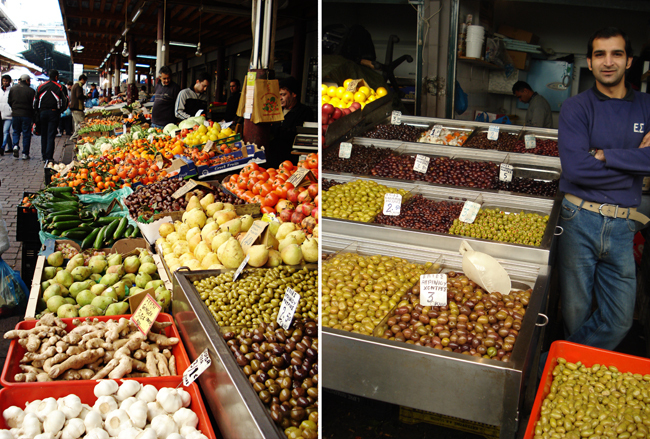 Love seeing the pictures, I had a really really great time when I visited Greece in 2008 and still am dreaming of the food! I REALLY wanted to go to Greece when I studied abroad but unfortunately right around that time was when a lot of the conflict started. I'm holding out that I will still get to go one day! I have never been to Greece. Beautiful pictures! I can't even imagine standing in some of those places that are so filled with history. Forget our pidly US history of a couple hundred years. That's nothing! Top of the bucket list right now (well, always and forever) is Paris, followed by some places in Germany, Switzerland, Spain....actually this list could go on and on! Greece is amazing! We spent our honeymoon on a Mediterranean cruise. My only regret is not having longer in the Athens area. I want to go back and spend more time exploring there. Greece is definitely on my list of places to go. I love that so many of the building are still intact. I love all the stucco and red tiled roofs. Italy is also on the top of my list of places to go. Ahhh, Greece! Now I want to go even more. :) As you probably know (I think I bring it up every chance I get), we were in the airport about to head to Greece when our flight got cancelled. So to France we went! We were so bummed about our trip not happening, and it's bittersweet hearing about other people's experiences. We really want to go! 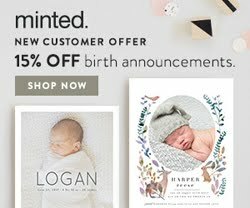 Three extra days?? Jackpot!! Such a gorgeous place. I'd love to visit Greece someday. I've only been on cruises, so never really traveled a country (I imagine going to a country instead of just the cruise docks would be a little more interesting), but Greece looks so pretty! 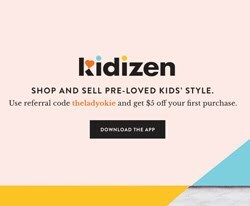 What an incredible opportunity! Greece is the #1 place I want to visit. I just love everything about it. Maybe one day I'll get there to see all those cute little houses! I want to go to Greece! But really I will accept traveling anywhere right now. Need vacation. No vacation time to spare. This makes me want to travel again! I actually lived in Sweden for a year during high school and got to travel to many European countries. Then my brother lived in Scotland so I used his place as my home base and wandered around a few more countries. It has been 6 years since I've been outside of Canada (other than a few trips to the US) and I really have the itch. Looks phenomenal! I've never been across those waters so you're making me jealous! Your photography was amazing back then as well, I might add! It's so cool to read about this past trip! That bridge/canal picture is amazing. My parents love Greece. They'd move there if there weren't grandkids involved. I want to visit someday. My never been to before list is Australia, Patagonia (Argentina), Cape Town, and India. And anywhere I can get in a great scuba diving trip! You got to see the coolest things! Being from America, sometimes it's just so mind-boggling to see buildings that are like 10 times as old as our country. 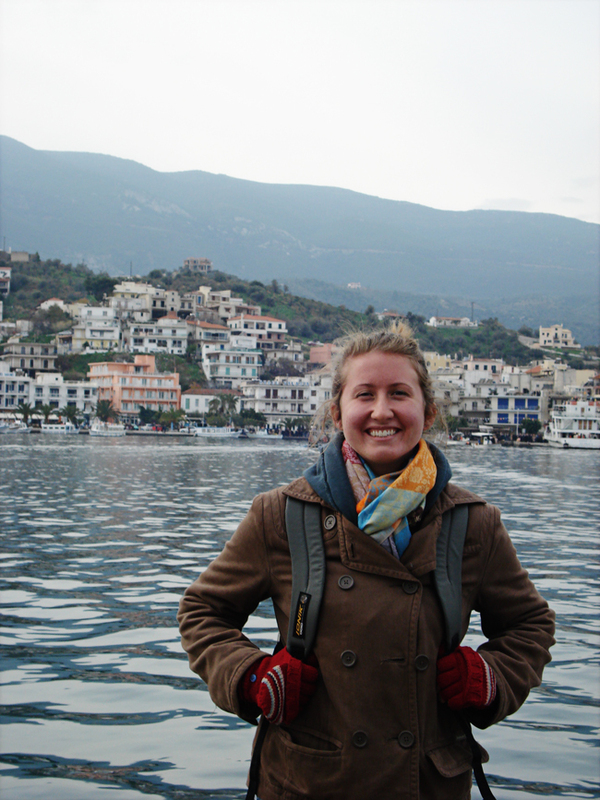 Going abroad in college is a really smart move--getting credits while having way more fun than sitting in a classroom! Our college really promoted either January term (3-weeks abroad) or full semesters. I came super close to deciding to go abroad twice for college classes--once to Europe and the other time to China, but life intervened and I didn't end up applying. Angel go to the interview stage for a 3-week trip/class in Mexico, the focus of which was language learning, but when they interviewed him, they figured out that his motivation for going was purely for the fun of it and chose people who actually wanted to have the chance to learn and practice Spanish instead. haha! Hey! We were seniors in college at the same time. :) I was a senior in January of 2008 too (graduated in May). Anyway, that is completely beside the point of this awesome post. I love that you got to go to Greece! How awesome! These photos are great. It's on our travel list for sure. We're talking about maybe next year, but who knows when it will actually happen. This post just makes me want to go SOON though!